While Day 10 was dominated by my tangential relationship to the hiker rescue that I detailed in the previous entry, I did engage in some photography. 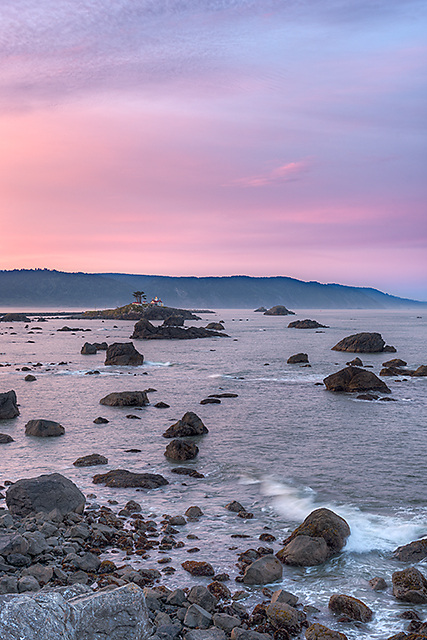 I returned to the Battery Point Overlook in Crescent City–first visited the previous day–in the pre-dawn darkness of Day 10 with the hope of experiencing some great light. While the view from the overlook faces south-by-southeast, I was still essentially pointed in the right direction. 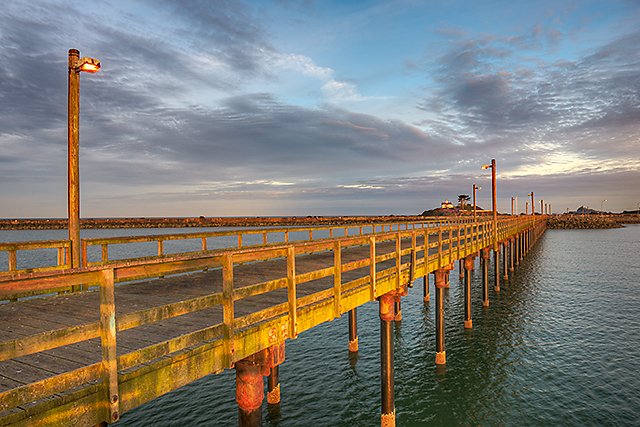 Before the sun crested the mountains to the east, I got back in the car and drove the short distance to the Crescent City Pier–another location I’d photographed from the day before–and made my way down to the end of the platform shortly before the sun began to make its impact. I was ready when it did. 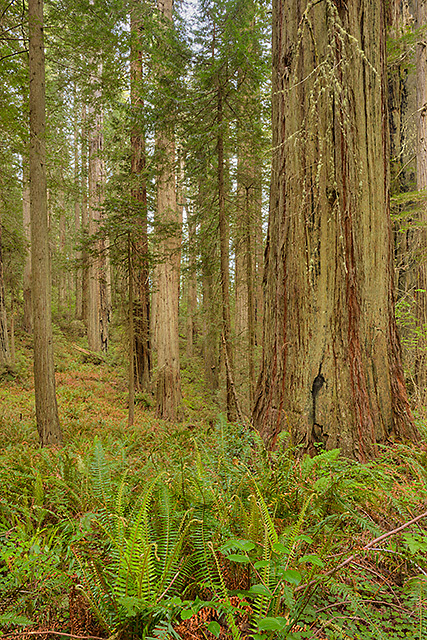 From this point, it was back to the Damnation Creek Trail in Del Norte Coast Redwoods State Park. 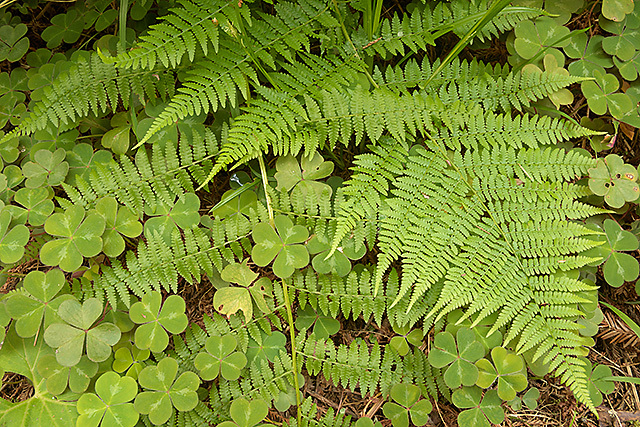 I knew from the previous couple of days that the forest there–on a steep hillside that dropped off to the west–would remain in soft light for a couple of hours. I’d decided in advance that it was now or never with regard to the rhododendron–the rumors of daily fog having been greatly exaggerated. Other than the lack of fog, I determined that the conditions wouldn’t be any better than they were that morning: even light and dead calm. 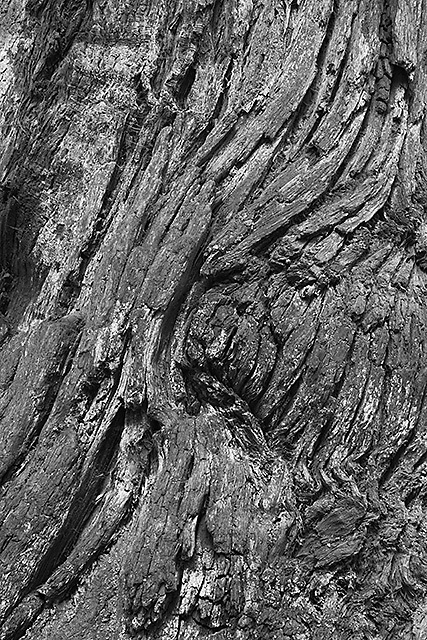 Having scouted the location as far back as Day 7, I knew that absolute calm would be needed because I was going to have to photograph the scene with a long telephoto lens and acquiring the depth of field I wanted for the scene was going to require focus stacking–and probably quite a bit of it. 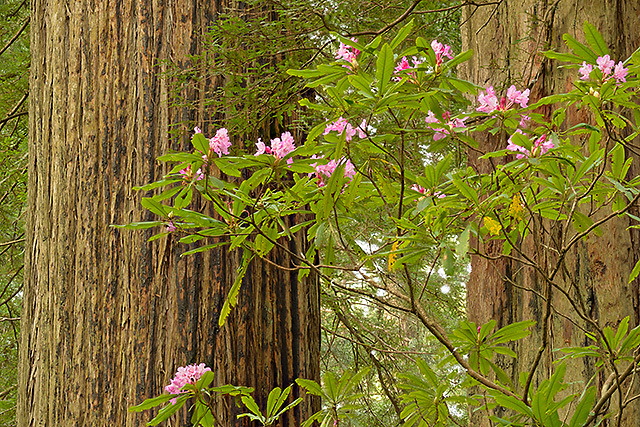 Executing the shots I was after was probably going to take 15-20 seconds per set of exposures and any meaningful movement upon the part of the rhododendron blossoms, leaves or tree branches would ruin the shot. 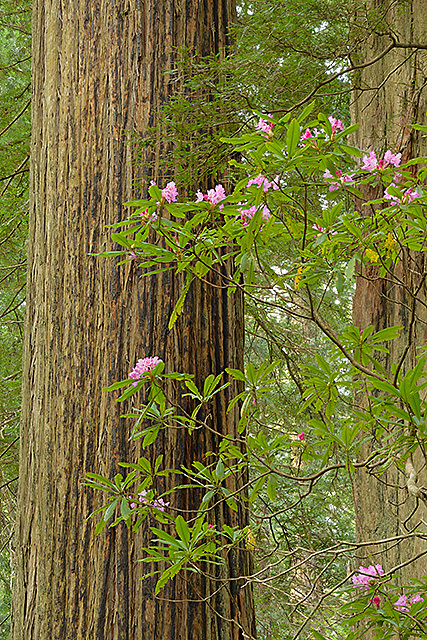 Fortunately it was absolutely still as I made the 1/2 mile walk from the Damnation Creek Trailhead to the flowering rhododendron that I had been eyeing for parts of the last three days. I arrived on the scene, set down my pack, pulled out the camera body with the 80-400 mm lens attached and moved to the location I had previously identified as the best vantage point. The flowers were well above eye level–probably 15 feet or so above–and something like 30 or 40 feet away. 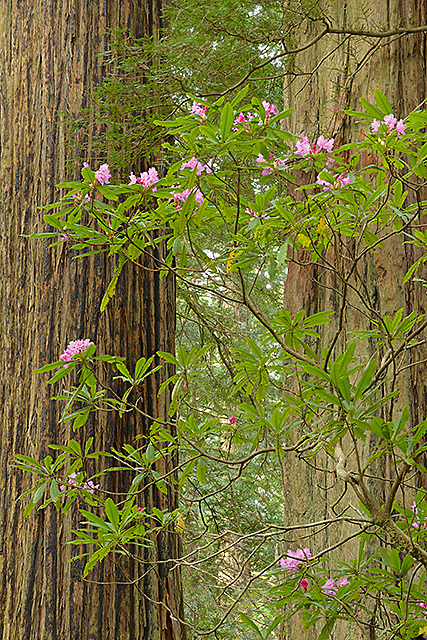 I had selected this location not just because it was physically accessible and gave a clear view of the blossoms, but also because of the backdrop–several wide redwood trunks. I set up the tripod and fine-tuned the composition. Then I made a quick test to see how many shots it would take for me to obtain front-to-back sharp depth of field at f/7.1. The answer was five. It was going to require five exposures, adjusting the plane of focus slightly with each shot, to obtain the necessary set of images. I wanted to make the exposures at base ISO (100) to maintain the best image quality and since it was still fairly dark in the forest, the exposures themselves were pretty slow. Nevertheless, as noted, there wasn’t a breath of wind. I didn’t know how long these conditions would hold, so I worked as quickly as I could. I made some slight adjustments, rotating for a vertical orientation, moving my position slightly and changing the focal length a bit with each shot. The below image required a sequence of eight exposures. The following pair of shots necessitated nine exposures apiece to complete the stacks. Despite the lack of fog, I recall feeling pretty pleased as I moved on down the Damnation Creek Trail after completing this sequence. 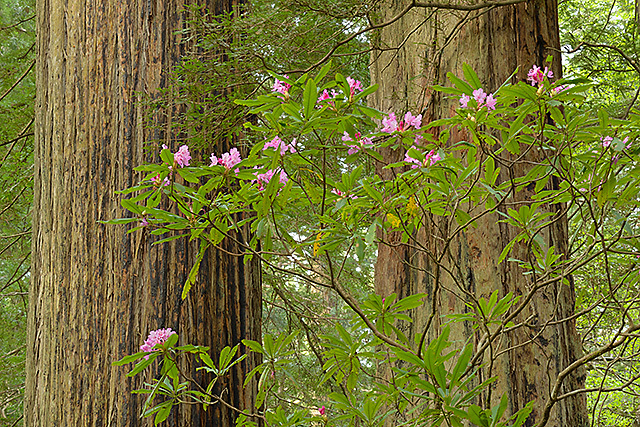 Prior to making the trip, I had hoped to see and photograph rhododendron in the redwood forest and, despite the total lack of fog (and the near total lack of flowering rhododendron) I had done so. Now I was off to the Coastal Trail to see what else I could find. It was just moments after I packed up following the rhododendron images that I encountered John and the rest of my day unfolded quite differently than I had anticipated. 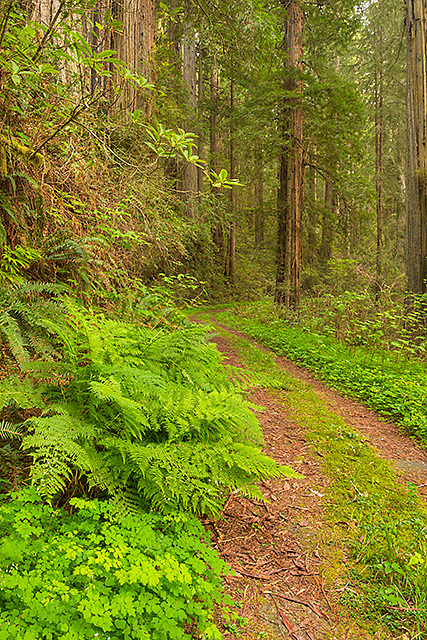 It was late afternoon when I finished putting my thoughts together and I decided to simply return to the Damnation Creek and Coastal Trails to try to engage in the process that had been put on hold that morning. There were no vehicles in the parking area when I arrived, about 2 1/2 hours before sunset. It was almost as though the mind-bending activities surrounding the rescue had been a dream. I got my gear together and wandered back down the trail, planning to spend what remained of the day on the two trails. 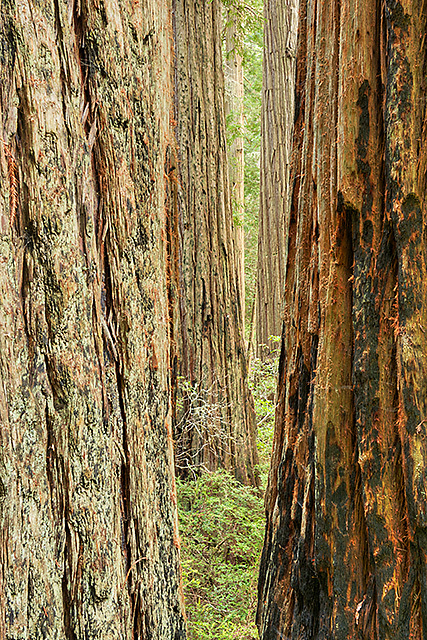 To my superficial surprise, I found this to be among my most productive sessions amidst the redwoods. I thought I might be distracted, but I was able to “get in the zone” and it was clear to me that I was becoming increasingly immersed in the unique forest environment with each passing visit. At first, parts of the forest were still impacted by occasional hotspots from sunlight, so I spent a bit of time working on intimate compositions. Over time, the light in the forest began to even out and I started to cast about for wider views–though I didn’t ignore intimate compositions entirely. There had been a modest breeze earlier, but the later it got the more the wind died down. This was a fortunate–if expected–development, because the later it got the darker it became…and that meant longer shutter speeds. 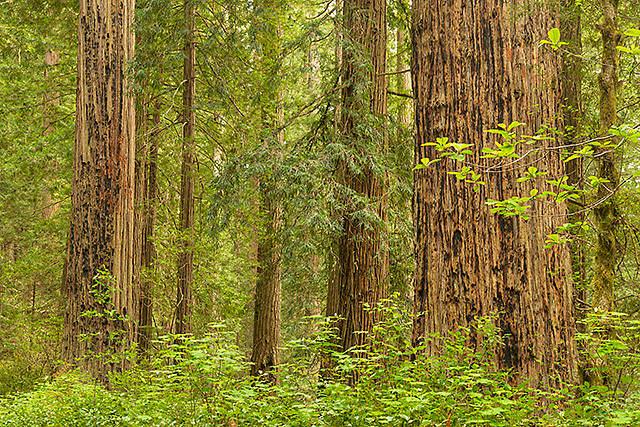 Given the copious, capricious foliage in the forest, the lack of wind was welcome. 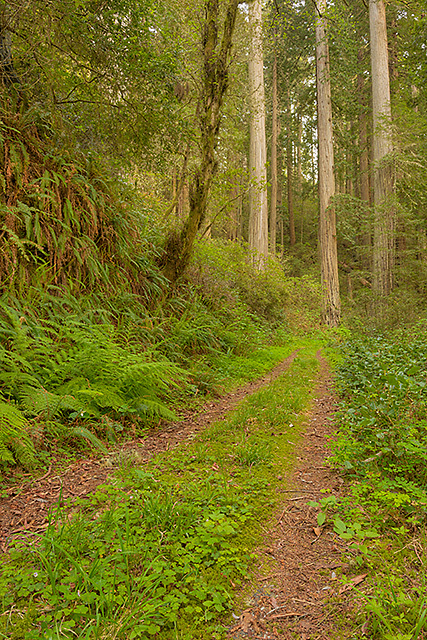 Much of the Coastal Trail in Del Norte Coast Redwoods State Park is the remnants of the old coast road–the highway bed that predates the current US 101. It mostly manifests itself as a two-track today. 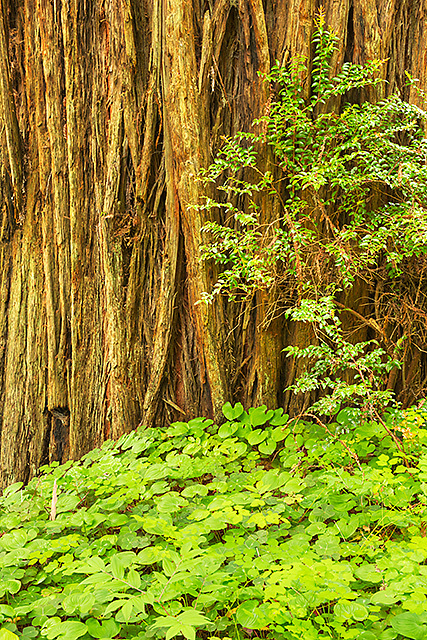 Very, very late during this session–as I was heading back on the Coastal Trail in the direction of its junction with the Damnation Creek Trail as I prepared to hike out–I spotted what I saw as a “tunnel” through a series of redwood trunks. Photographing it the way I wanted to, at 70mm, again required focus stacking–just five exposures this time. It was dark when I returned to the trailhead. It had been a good evening’s shoot, heading north on the Coastal Trail. 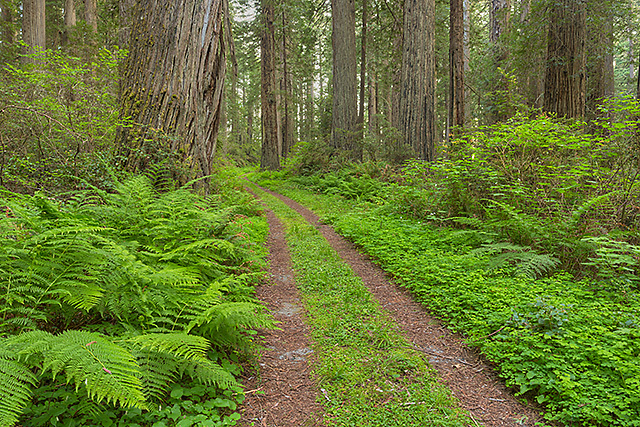 I knew that there were interesting scenes heading south on the trail based on my earlier scouting, but that would have to wait until the following morning–my last in the redwoods region. After my morning excursion on Day 11 I would begin my long (more than 300-mile) drive to Silverton, Oregon, the jumping off point for my time at Silver Falls State Park. Wow, what a full and varied day with a rescue in there as well, beautiful rhododendrons. Thanks, Emily. Focus stacking in-field technique isn’t nearly as difficult as I probably made it sound. The main problem deals with potential subject movement; if that’s not an issue then the process is quite straight forward. 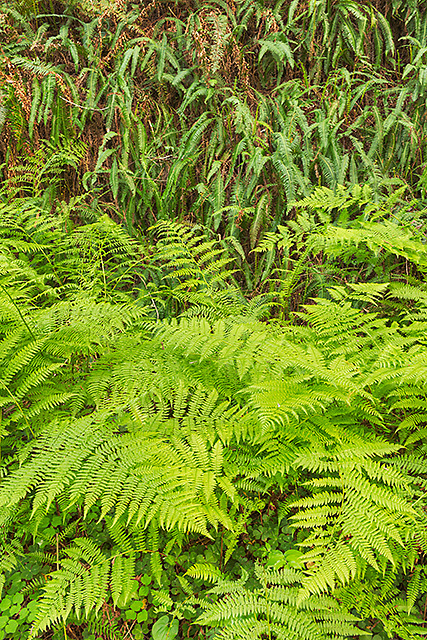 If there are a lot of potential moving subjects (foliage, flowers, etc.) in the frame and if it isn’t completely calm, I typically don’t even bother trying. Ah yes. I could see buildings or flowers inside an atrium would be easier. Thanks Kerry and hope all is well with you. One of the most common uses of focus stacking to extend depth of field is macro photography I think the first time I ever messed around with it was photographing a mushroom 10 or 11 years ago) and that’s most easily done in a studio setting, where everything can be controlled. (That’s a great practice environment, not incidentally.) The first time I played around with the technique in a landscape setting was at White Sands National Monument eight years ago (http://www.lightscapesphotography.com/White_Sands_layers_0004-0008_hf.htm); note the absence of anything in the frame that might blow in the wind. Thanks for taking the time to comment, Emily. Everything’s fine on my end and I hope the same is true with you. That first shot is utterly delicious! Love the soft light and colors. You are totally motivating me to take a crack at dawn one of these days! The storm this past week brought some delightful sunset color and loads of clouds. Pity I was restricted to the house for ankle surgery. The fire down near Gold Beach is now classified as ‘contained’. The stormy and cooler weather helped. Nice to see that you managed to catch some of the rhododendrons. Thanks…glad to hear that the fire finally appears to be under control; hopefully you’re well along in the post-surgical mending process. I love the deft use of light and color in your images, it makes them so engaging. Participating in the rescue operation didn’t throw you off your game at all, these are some of the best images you’ve done that I’ve seen!